Wayne Harrelson - AKA "Karnis - steps in tonight with a review of a figure I'm very, very much interested in. Take it away, Karnis! Thanks Michael for allowing me another opportunity to participate on your site…the best of it’s kind of the web! Enterbay has been around for a while now in the 1/6 scale arena, releasing figures from fringe licenses and cult figures with varying degrees of success. Recently though, they moved into the ¼ scale market with well received products from the Terminator and Rambo franchises. 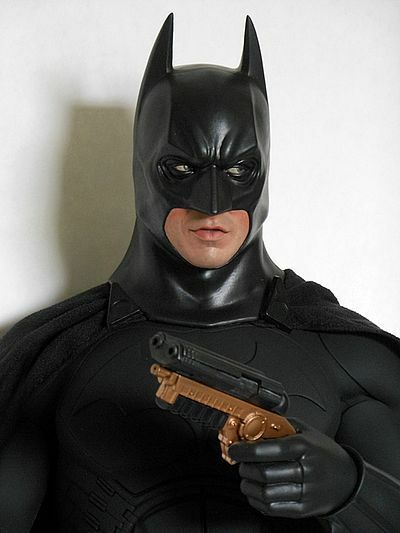 But now they’ve stepped into big boy territory with the release of their latest offering from their new HD Masterpiece line, The Dark Knight himself, Batman, in his original costume from the Christopher Nolan blockbuster movies. This is without a doubt their highest profile release yet; let’s take an in-depth look at the figure and see how they fared. Taking a “substance over style” approach this time around, Enterbay went with a simple but lightweight and elegant box, primarily designed to reduce shipping costs while providing ample protection for the product. It’s made of a type of Styrofoam that is a bit softer to the touch, crafted to absorb blows and stand up to the rigors of overseas shipping. It has an industrial design to it, sporting the Dark Knight logo and a jet black color scheme. On the inside, the figure itself and the four (yes, four!) heads are protected in form fitting black foam in the upper tray, while the accessories reside in the lower tray covered by a clear plastic cover which sits on top of the base, housed in the bottom of the box. It’s a collector friendly box with nary a twist tie in sight, and all the gadgets fit nicely in the vacuum-formed tray, protected by a single sheet of clear plastic. It’s not fancy, and not really designed for display, but it does the job and does it well. Credited as the main sculptor on the project is Scuderia and he’s done a magnificent job. 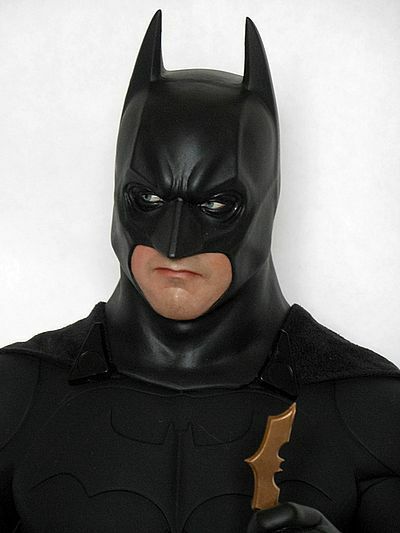 The three different face plates for the figure really capture various expressions of Christian Bale, and the likeness is unmistakable. Of particular note is the open-mouthed face plate, which is almost scary in its’ lifelike appearance. The other options are a neutral and an angry mouthpiece, and both are outstanding in their own right. 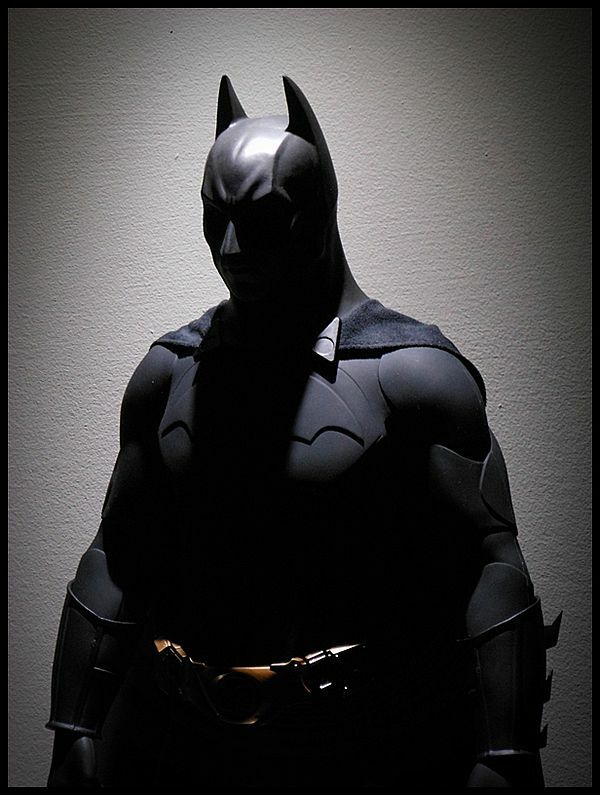 There are also three versions of the Batman cowl, one looking straight ahead and the other two looking left and right. Combined with the three swappable face plates, this gives you nine different display options to play with. I find this approach preferable to the competitors “moveable eyes” scheme as it can sometimes be unconvincing in appearance and result in unattractive hatches and seams to access the eye control joystick. All three cowls are well proportioned and perfectly scaled reproductions of the “Begins” cowl. 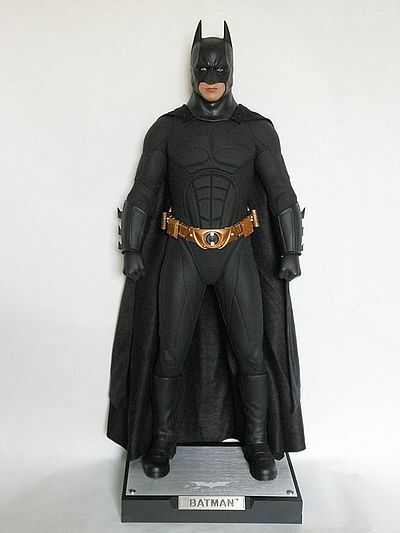 One of Enterbay’s strengths over the years has been their head sculpts, and with this effort they have produced the finest mass produced Nolan-based Batman cowl yet. 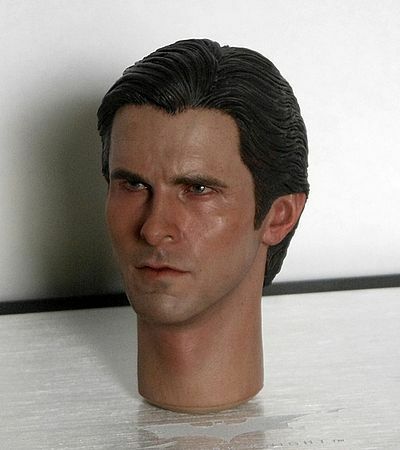 There is also an unmasked Bruce Wayne/Christian Bale head as well, and while the likeness is quite good at certain angles, it’s not quite as convincing as the cowl/ face plate combinations. It’s there if you want it, but because the cowls are so well done, the Bruce Wayne head will reside in the box for most collectors display purposes. Paint apps are another strength of Enterbay, and here they do not disappoint. There’s not a whole lot of paint work overall but what is there is outstanding. The flesh tones of the face plates are as real looking as it gets. If you hold one of them in your hand you can see how well it replicates natural flesh tones. They feature just a hint of a 5 o’clock shadow and the cheeks have a bit of a rosy red hue to them at the edge of the cowl, suggesting the tight fit of the mask. 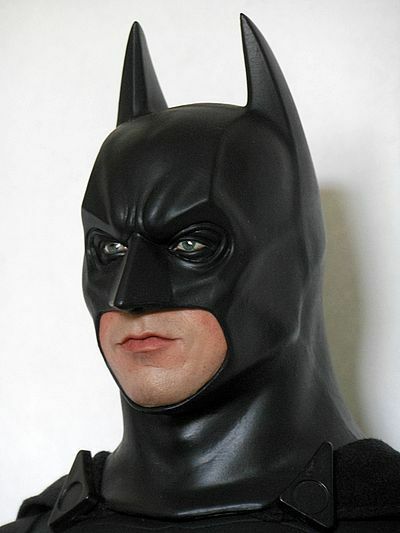 The eyes are subtle and detailed with a glossy finish that compliments the overall craftsmanship, and the makeup around the eyes is made to look like a continuation of the cowl. There’s not a lot of other paint work to speak of beyond some of the black lines on some of the utility belt contraptions, but they are clean and free of slop for the most part. This adds up to a very lifelike appearance at this scale. For those of you who like to take pictures of your figures, you’ll appreciate the photogenic quality of this piece. It’s hard to tell exactly what is going on with the body under the suit, but it feels very much like the model used for the T-800. The body itself is very sturdy with a lot of weight to it and stands well without the need of additional support. The neck joint has free range of motion and has a “barbell” peg that the cowls connect to. Most of the joints seem to be the “click/ratchet” style, which tends to hold poses very well given its size. The biceps have a swivel joint, the shoulders can move up, down, forward and back….but they don’t have the “shrug” joint that most of the popular sixth scale bodies do these days. The waist is articulated as well as it moves front to back, side to side and will twist a bit as well. I suspect it has ball jointed hips, double jointed knees and rotating peg ankles too. Given all these points of movement you might wonder why I only give the articulation three stars. This is because of the nature of the suit; it does restrict the ability to do anything beyond some simple poses. You just don’t want to stretch the legs or arms too much for fear of tearing the suit. 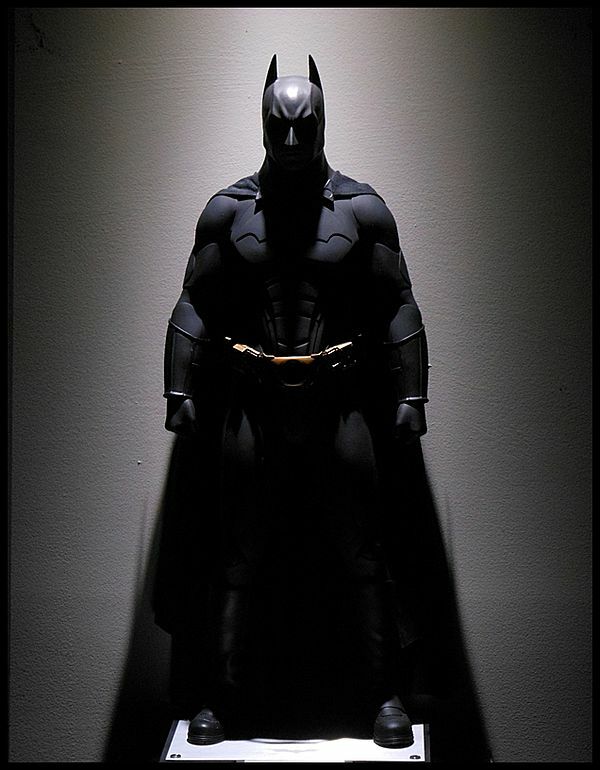 Fortunately, this Batman is an imposing figure just standing in a basic museum style pose or holding a couple of his weapons, and most collectors will find that to be very satisfying by itself. Couple that with the different combinations of cowls and face plates and you can get easily a lot of character out of the figure for your display. There is a nice variety in the types of hands Enterbay provided, with a pair of fists, a pair of relaxed hands, and two pairs of hands designed to hold various weapons. All are cast in gold and/or black colored plastic and are scaled correctly to the figure. The grapple gun is the standout here; the detailing is superb and has a sliding mechanism on the top. It has a holder which hangs from the side or the back of the belt. The grapple gun looks great whether it’s mounted on the belt or held in his hands. Also noteworthy are the different sized pouches and capsules designed to attach to the Utility belt; Enterbay mixed it up enough to give you plenty of display options. All of them attach to the belt with the use of small, round magnets (the same type used for the cape clip scheme) but they don’t stick to the belt with a strong enough grip and have a tendency to fall off somewhat easily if you handle the figure. Some of the magnets also fell off the pouches as well, and while a small drop off super glue will cure that problem, it’s also emblematic of some of Enterbay’s factory quality control issues that happen from time to time. 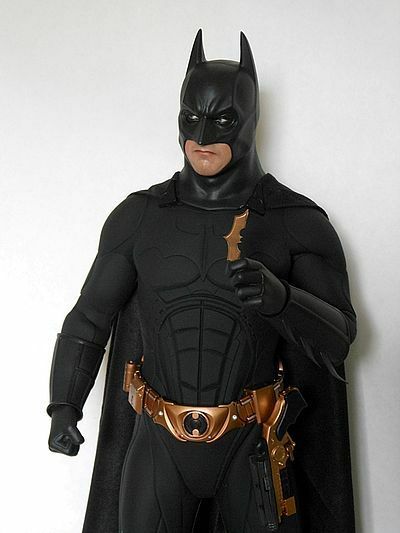 Large and small Batarangs are included and enhance the posing possibilities of the figure. There also Batman’s cell phone and the pneumonic Mangler for you to use if you wish. A nice touch is the sonic heel device Batman used to summon the horde of bats in the first movie, and there’s even a space for you to attach it to the heel of the boot if you wish. 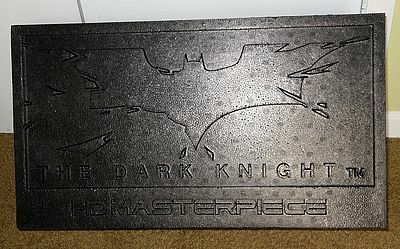 Lastly, there is the base/stand for the figure…it’s a simple square plastic base with a brushed aluminum plate on top, the Dark Knight logo etched on it and a Batman name plate on the front. There is also a round hole to insert the leg holder if you choose to use it (I personally don’t like using stands as it detracts from the presentation). 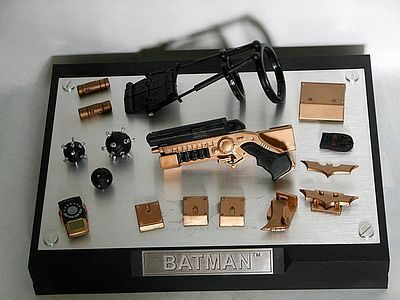 In summary, the accessories set isn’t as impressive as say, the one included for the T-800, but that is because of the nature of the devices Batman uses in the movies as opposed to any issues or exclusions by Enterbay. Previous attempts by other companies resulted in a Batman Begins style suit that was less than satisfying. The rubber felt somewhat cheap, tacky to the touch, delicate and unforgiving. Some reports had the suit drying out or tearing, and others stated that paint apps were flaking off. Collectors who posed their figures in dynamic poses found that permanent creases had developed at the joints. I’m happy to report that Enterbay has used a higher quality of rubber material for the suit. It’s much slicker to the touch, yet tougher and seemingly more durable. I liken it to rubber I’ve seen used as covers for smart phones and other handheld electronic devices. There is no paint involved with the suit; it’s got a very flat black, matted appearance to it. It’s a two piece suit as well; the shirt fits down around the crotch over the separate pants. There is also some padding in the chest area to fill out the suit for a more muscular look. The gauntlets fit nicely over the forearms if positioned correctly (with the fins lined up at the elbow) but they do have some burrs on them from the molds on the seam lines. They should have a glossier finish to them for proper screen accuracy but they are a little too matte. The fins are quite soft and pliable compared to what we’ve seem in the past also; this reduces the chances of them breaking off, but does increase the possibility of warping. The boots are solid and well proportioned relative to the size of the figure and keep the ankles nice and sturdy. 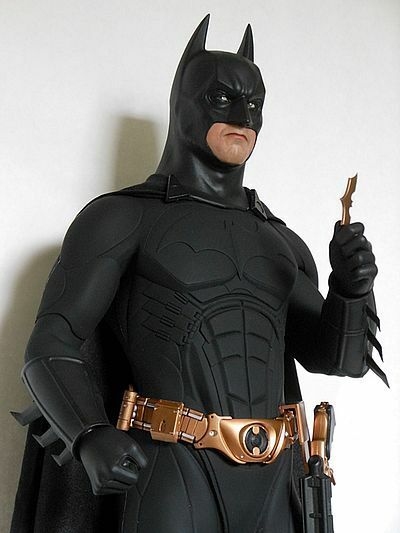 The lines in the suit are detailed, clean, sharp & extremely screen accurate…no complaints here. It’s a marvel to sit back and admire. The belt has a metallic look to it and the accessories use magnets to attach to it. However, it does sit slightly high on the waist out of the box, but if you open it at the connector in the back and spread it out a bit you can get it to sit below the forth ab plate for a better presentation. The cape is made of a smooth, satin-type material and is reminiscent of an expensive polishing cloth…it drapes nicely over the shoulders but in my opinion is not quite dark enough to be entirely screen accurate. I have heard one report that the latest production runs have capes that are darker in color. The cape itself attaches to the suit with a series of magnets in the suit and on the cape clips, but for my tastes, the magnets in the suit are not in the optimal position for screen accuracy. Fortunately, it’s a relatively simple process to move them a little for the best cape position. The clips are also a bit too big for this scale and not quite detailed enough. Another issue worth noting is the difference in finish between the suit and cowl; they should be virtually identical for screen accuracy, but given the different materials used for each, the cowl has a bit of a shinier look to it relative to the suit. Also, some owners have reported some cowls are shinier than others, even in the same set. Hopefully Enterbay sorts this out in future production runs. Looking at the figure in totality however, Enterbay has done an excellent job in recreating the Begins suit at this scale given the price point of the piece. It’s easily the best version of the Batman Begins suit on the market today. Value is a subjective term in the collection world, and even more debatable in today’s economy. I paid $360 direct from Enterbay plus $60 for Priority International shipping. 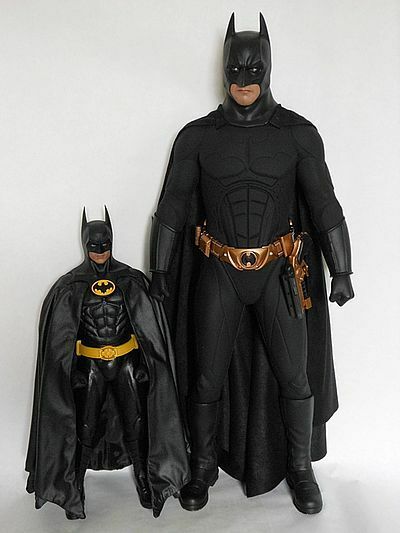 Consider the size of the figure and the associated quality of the packaging, sculpt, suit, and accessories, and then compare it to the prices currently established for similar products in the 1/4 scale market these days. For about the same price or less you’re getting a better paint job, better outfit, a lot more accessories and the ability to pose the figure as well. In the realm of pop culture collectibles you’re getting a very good bang for your buck. Obviously, this is no kids toy to be played with, given the size, weight and price of the figure. It’s an adult collectible meant to be prominently display in your collection room or home theater. But given how impressive it is with its’ commanding presence, you will no doubt get many hours of satisfaction just looking at it. 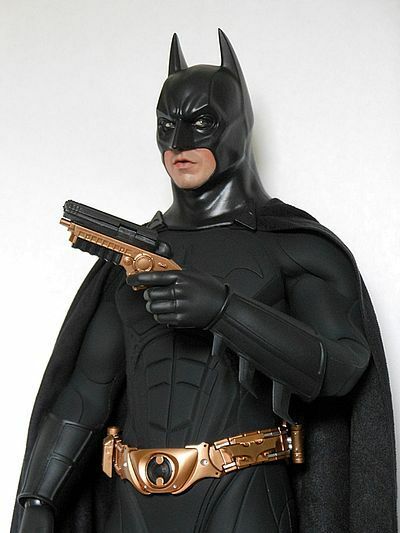 Make no mistake, this is no “action figure”…it is the centerpiece of any Batman-themed collection and you, your family and your friends will no doubt be amazed at its’ lifelike quality and sheer awesomeness. The first thing you need to do when considering this piece is to forego all thoughts of this as a large action figure. Think of it as a poseable premium format figure. If you are currently collecting ¼ scale figures, you already appreciate the detail and presence a larger scale figure brings to the table. If you are a 1/6 scale collector, prepared to be amazed at what the format has to offer. Enterbay has done an excellent job with their first Batman figure, and their HD Masterpiece showcases the strengths of that product line. They have delivered what I consider to be the most movie accurate, Nolan-based Dark Knight figure to date at a reasonable price (given the current status of the hobby). It’s not perfect, and no collectible really is, but overall it’s a mighty impressive piece of work. If you are a Batman collector, you should strongly consider owning this piece if you don’t already. It can serve as the centerpiece of your Bat-collection for years to come. I highly recommend it and applaud Enterbay for their efforts. As I mentioned above, you can order this direct from Enterbay’s website for $420.00 including shipping. BBTS has it for pre order on their site for $449 (they do mention the price could change), shipping in 2013. Enterbay also announced a partnership with Diamond Distributors to make products available thru their retailers in the US, so keep an eye out for that as well. You can also purchase it through various overseas sellers on eBay. This product was purchased for the review by the reviewer. Photos and text by Wayne Harrelson AKA "Karnis.